Photo Caption A: The WindowsWear Museum at Berkeley College reveals the latest addition to its exhibit during a reception held at Berkeley College in Midtown Manhattan on September 29, 2017. The display is from Saks Fifth Avenue’s 2016 holiday window campaign, Land of 1000 Delights. The WindowsWear Museum at Berkeley College continues its mission to preserve the historic and artistic roles of window displays in the fashion industry with its latest installation. Hosted at the Berkeley College campus at 12 East 41st Street in Midtown Manhattan, the exhibit features a display from Saks Fifth Avenue’s 2016 holiday window campaign, Land of 1000 Delights. More than 100 professionals from New York’s fashion industry celebrated the launch of the installation during a reception held at the Berkeley College campus in Midtown Manhattan on September 28, 2017. The Berkeley College Fashion Merchandising and Management program integrates the creative and business aspects of the fashion industry with current technologies through courses in consumer behavior, product development, merchandising, retail distribution, marketing and sales. In 2016, Saks Fifth Avenue transformed into a Land of 1000 Delights, an enchanting landscape of colorful candy and festive fashion that appeared in all 41 Saks stores in the U.S. and Canada. The window display currently housed in the WindowsWear Museum at Berkeley College was one of the candy-inspired displays from the Saks Fifth Avenue New York flagship store. The addition from Saks Fifth Avenue accompanies the WindowsWear at Berkeley College’s first installation, a display from Coach that pays homage to the brand’s New York heritage. The exhibit is open to the public from 8 a.m. to 9 p.m. daily on the first floor of the Berkeley College campus at 12 East 41st Street in Midtown Manhattan, and is the first stop on WindowsWear walking tours of notable fashion windows in Manhattan. For more information about the WindowsWear Museum at Berkeley College, visit www.windowswear.com/museum. Photo Caption B: Representatives from Berkeley College, WindowsWear, Aveníu Brands and Saks Fifth Avenue gather in front of a display from specialty retailer Saks Fifth Avenue’s 2016 holiday window campaign, “Land of 1,000 Delights,” during a reception held at Berkeley College in Midtown Manhattan on September 29, 2017. 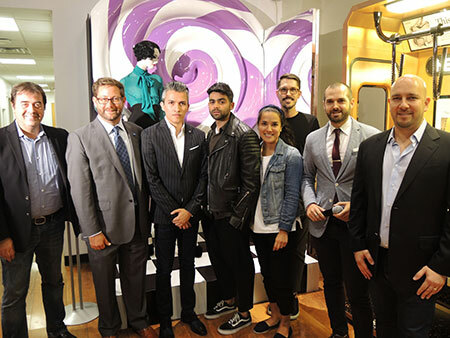 Pictured from left to right are Jeremy Gray, Northeast Area Sales Manager, Aveníu Brands; Ted Havelka, Campus Operating Officer, Berkeley College in Midtown Manhattan; Raul Tovar, Creative Director & Co-Founder, WindowsWear; Raylin Diaz, Visual Windows Director; Aurora Cardenas, Senior Manager, Corporate Visual; Alex Simone, Window Stylist, all three from Saks Fifth Avenue; Jon Harari, CEO & Co-Founder; and Mike Niemtzow, President & Co-Founder, both from WindowsWear. A leader in providing career-focused education since 1931, Berkeley College is accredited by the Middle States Commission on Higher Education and enrolls more than 8,000 students – including more than 550 international students – in its Master’s, Bachelor’s and Associate’s degree and Certificate programs. Students can study in more than 20 career fields. Berkeley College is comprised of the Larry L. Luing School of Business®, the School of Professional Studies, the School of Health Studies, and the School of Liberal Arts. The School of Graduate Studies offers an MBA in Management online and in Woodland Park, NJ. Berkeley College has five New Jersey campuses – Dover, Newark, Paramus, Woodbridge and Woodland Park. In New York there are three campuses – Midtown Manhattan, Brooklyn and White Plains. Berkeley College Online® serves a global population. The website address is www.BerkeleyCollege.edu. WindowsWear (http://windowswear.com) is the “Google Earth” of stores, featuring online in real-time, the largest and most comprehensive database of the world’s fashion window displays, interiors, and e-commerce packaging. The best visual creative teams and schools use WindowsWear for inspiration, trends, competitive analysis, and more. Clients include Ralph Lauren, DVF, Calvin Klein, Marc Jacobs, Kate Spade, Tory Burch, Nordstrom, and more, including more than 100 colleges and universities worldwide. WindowsWear has been featured in Vogue, ELLE, WWD, Glamour, Redbook, The New York Times, The Wall Street Journal, and more.